Comments: Comments Off on Fit Radio Success Story: Jasmine O.
I am 37 years old and married. I am a mother of two and I love to workout. I have been on a weight loss journey since 2011. I’ve experimented with everything from diets and crazy exercises. I finally started on weightlifting, which I currently love. However, we all know we need some of that cardio, that’s when I stumbled upon Fit Radio on Facebook. 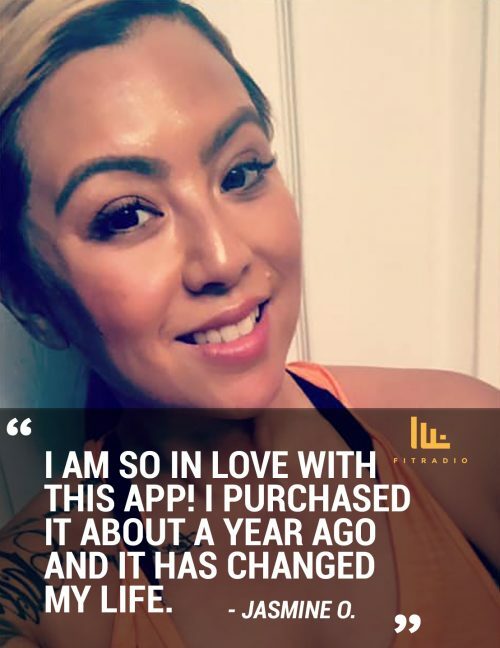 I tried the 30 Day trial and fell in love with all of the Cardio Coaching workouts and have never looked back. I’ve never been very enthusiastic about cardio until I came across Fit Radio. I love that I can choose a different cardio workout every time while jamming to my favorite genre of music. I don’t have a favorite DJ in particular, but I do love the wide variety you offer! I really enjoy my cardio workouts now and can’t wait to give a shout-out to my #CardioCoach that day along with that sweaty selfie. For me, it’s accountability and it’s a great way to give props to my coach for the day. I will admit, I have yet to try the Strength training tab, but so far my favorite is the Cardio Tab. Starting last year, I increased my cardio to 3 days a week and over these past few months have dropped 11 lbs with Keto and these amazing cardio workouts! I rave about this app to all my friends and I now tell them that maybe, just maybe, I may love cardio again. Thank you for being a coach right in my ear whenever I need it!